Socket outlets are the ultimate ‘point of consumption’ of electricity and at the front line of a user’s electrical connection. Consequently, wherever they may be installed, several safety precautions are required. The history of standards for sockets in South Africa goes back 80 years, starting with the British System and continuing through to the IEC standards that followed in the 1990s. We now have nine standard configurations with an additional 12 dedicated versions to complete a range of products legally available in South African Electrical Installations. 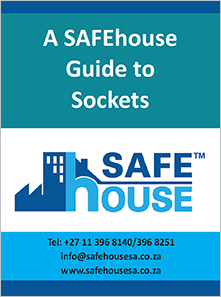 The SAFEhouse Guide to Sockets covers plug configurations which are applied to any type of socket outlet, whether part of a fixed installation or of products such as cord extension sets and adaptors.